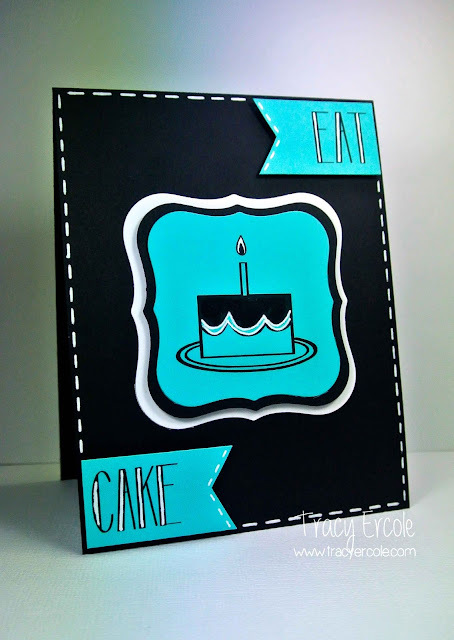 Hi, I am so excited to be guest designing for the latest Little Tangles Challenge - Let's Eat Cake! AND to be a part of the Neat & Tangled Birthday Bash! It's no secret that I love Neat & Tangled stamps, Danielle's designs are so fun to use, but if you haven't had the opportunity to purchase any stamps yet, you can still join in by using the new free digis available! I have used them for my card ;) Get yours at http://littletangles.blogspot.com/p/free-digi-stamps.html. You have until September 1 this time around to submit your card, so more time to join in. The winner will receive a stamp set of their choice from Neat & Tangled. Now on to the Hop, you should have come my way via the fabulous Laurie Willison (I can't believe I am following her on a hop actually, she is amazing!). Two winners will be drawn at random from comments on one of the blogs listed, so comment on as many as possible to better your chances, the winners will receive a $5 gift card to the Neat & Tangled store. Also, rumour has it that one blog hopper will win THE ENTIRE Neat & Tangled stamp collection to date! Can you believe it, you better get hopping and commenting! You have until August 24 to comment, winners will be drawn on August 25. The next stop is the fabulous Amy Tsuruta, I'm certain she has something awesome for you. If you get a bad link along the way the list is below. LT GDT Tracy Ercole - ME! such a cool card. this would be great for a male or even a TEEN! love it! Love the bold colors, gorgeous card!! Fabulous card with those bold colours! Excellent inspiration!! What a great color combo Tracy! Your card pops right off the screen, love it! I order this card! It is a perfect boy card!! What a cool color combo! great card!!! fab card with the new digi and such great colors! do you put your colored cardstock in your printer to get it on color? Awesome card Tracy! Black, blue & white is one of my absolute favorite color combos! A nice bright look that is suitable for a guy or a gal card! Awesome faux stitiching!!! Stunning colors! Beautiful card, love the colors you chose ! Super cool! Love the colors you used! Nice use of the digital images. Thanks. Favorite colors in the whole wide world!!!! Love the black. Very chic. What a fab modern card from such a whimsical stamp...great stuff! So Tiffany-ish! Love that digi and I agree it needs to be bold and beautiful. Love the black with the bright blue! Great card! What a bold and fabulous creation! oh that's so cool!!!! AWESOME modern card! love the colors!!! love everything! what a fun use of that digi!! Congrats on your GD position. Your card is beyond WONDERFUL!!!! Love the color combo you chose! FAB card Tracy - LOVE, LOVE your colour combo!!! Love the bold colors!! Very strikingly beautiful. Wow, love the bold graphic style of this card! Neat to see the digis used on your card. I have no experience with this medium; you showcase it well. Thanks for the chance. So bold and graphic! Love this color combo, great design! You my dear, created a jaw-dropper. i love the strong colors. and you know how i feel about teal / aqua ;) i'm so glad i have other opportunities to work with a few of my favorite girls over and over :) thanks for hopping along with this stellar creation! miss you! I love the colors!! Looks great!! Wow love the colors you've used great card too. Thanks for sharing. Your card is wonderful...love the bold design! this is such a bold card , I really like the colours used !! Looks Great !!! Cute card!! I love the bright colors!! The black background really make the turquoise color and cake just POP! I like your aux stitching around the sides as well! Love the colors and layout of your card. The stitching is great. Super job. Wow this is gorgeous! Love what you did with these! I love the color combination! It's so unique - have never seen it before. Such an awesome card Tracy!!! LOVE those colors!!!! Thanks for sharing and happy birthday to Neat and Tangled!! Tracy, Great card! I like the colors you chose and the faux stitching! Thanks for sharing! I love the digi on colored paper!! Great job!